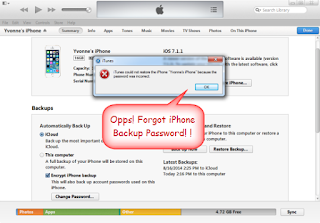 If you are reading this you are probably trying to restore to your I-phone device a backup you've made before and it asks you for a password which you dont remember. Crap! Heres a list of the default passwords that are being used (sometimes automatically) if you dont recall of ever setting a password while making your backup. Keep your fingers crossed and lets go buddy. Try your iTunes Store password. Try 0000 as the password, sometimes the default password is in fact, 0000. Try 1234 as the password, sometimes the default password is in fact, 1234. Try 123456 as the password, sometimes the default password is in fact, 123456. If itunes asks for a password which you think you have never set it can be the apple ID password but all in lower case. Try 123 as the password, sometimes the default password is in fact, 123. Tr ddd as the password, sometimes the dafualt password is in fact, ddd. * Right-Click and choose "Set Password"
* Close iTunes, reopen the program - reconnect the phone and use that password. Sometimes, the password can be a really old iTunes password that you set a long time ago but have since changed it. The original password is sometimes your backup password. This may be a bug in iTunes but try it and see if it works. If you are using a Mac, you can try using the Keychain method. First, open Applications > Utilities > Keychain Access.app. Second, in the search dialog, search for "iPhone Backup." Third, double click on the most recent entry for "iPhone Backup." Fourth, at the bottom of the dialogue box, click "Show password" and type in the administrative password for the computer. This will reveal your iTunes backup password! Try your Windows Administrator password. This is a common solution. Also, even more common is to try the Windows administrator password that you used when you first set up your computer or when you first set up your iPhone. If you are using Windows, the only thing left to try will be to change your iTunes password on your actual account to access the iTunes Store. 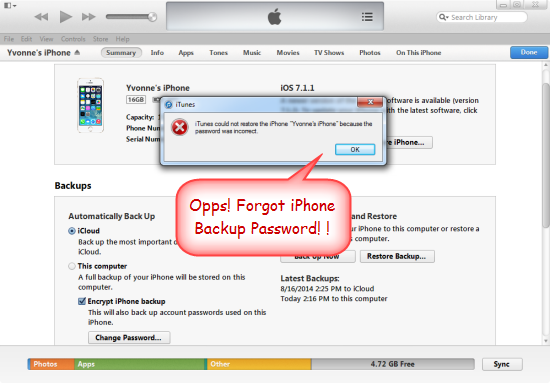 Then on the backup password dialogue, try the old password and the newly set password. If you have ever jailbraked your phone and changed the root password, that password is the correct one! Your only option now is to download a cracker (Google Iphone Backup Crack) and let it try to decode your password while trying every possible combination.